There have been moments when an event catches the public eye, and suddenly illuminates a process of decay and disintegration that has been proceeding in the background, slowly, step-by-step. The outrage and national attention focused on the conviction of, and imposition of life sentence on, Dr. Binayak Sen for “Sedition” is such a case. The process in question is the utter collapse of the majority of the Indian Judiciary into an agency of the political police. Our reality is that the supposed “rule of law” has decayed into a sinister farce over vast areas: most notably Kashmir, Chhattisgarh, and much of the northeast. A police state regime that arose on the frontiers is slowly, step-by-step, extending itself into the core. The rot of corruption and injustice has now reached the heart. The immense significance of the judgment against Binayak Sen is that it strikes directly at whatever hope remains for a peaceful means of arresting, or even reversing, this deadly process. Our responsibility is to insist on the right of political dissent, though without illusions. So long as the regime maintains the forms of the electoral exercise, of democratic rights, and of argued “judgments” in its courts, we must, as best we are able, strive to expose the substantive reality. From this perspective we sought an informed legal opinion on the written judgment issued against Binayak Sen by second additional sessions’ judge, Raipur, B P Verma. P A Sebastian, a Mumbai-based lawyer and democratic rights activist, and a leading figure of the International Association of People’s Lawyers, its Indian constituent, the Indian Association of People’s Lawyers, and the Committee for the Protection of Democratic Rights, Mumbai, has provided for us the following analysis. The charge against the accused in the case of Piyush Guha, Binayak Sen and Narayan Sanyal is that they have aided and abetted the Communist Party of India (Maoist), which has been banned under the Unlawful Activities (Prevention) Act. The case starts with the arrest of Piyush Guha, a tendu leaf trader. The prosecution says that on 6 May 2007 the police superintendent, Raipur sent a wireless message to all the police stations under him that the police should closely search suspicious persons, suspicious vehicles, hotels, lodges, rest houses and dhabas. They were also directed to search thoroughly the street vendors, detain all suspicious characters and legally proceed against them. In the course of carrying out such a search, B S Jagrit, the inspector of Raipur police station, was told by an informer to keep an eye on all those walking towards the railway station. Then he says that he suddenly spotted Piyush Guha. The police stopped and questioned him on the basis of suspicion, but not receiving satisfactory answers, the police called one Anil Kumar Singh, a passer-by, and took both to the police station and opened the bag of Piyush Guha and found in his bag three magazines, a newspaper and three letters among some other things. 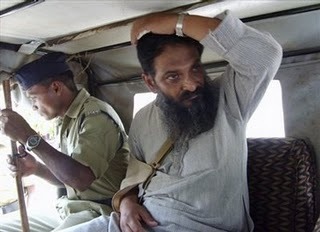 Anil Kumar Singh, the passer-by, deposed before the court that he heard Guha say to the police that Binayak Sen used to meet Narayan Sanyal, one of the three accused, in jail and collect letters from him. Binayak Sen passed on the three letters concerned to Guha, who, in turn, passed on them to the CPI(Maoist). The whole case revolves around this story which has many loopholes. Piyush Guha was produced before a magistrate on 7 May 2007 under Section 167 of the CrPC [Criminal Procedure Code]. He stated before the magistrate that he was actually detained on 1 May 2007, not on 6 May as claimed by the police. He was kept in illegal custody, blindfolded and incommunicado for 6 days in violation of CrPC, which stipulates that an accused should be produced before a magistrate within 24 hours of his arrest. He further said that he was picked up by the police not from the road leading to Raipur railway station as stated by the police but from Mahindra Hotel. The statement of Guha that he was picked up by the police from Mahindra Hotel is supported by the affidavit of the government filed in the Supreme Court while opposing the bail application of Binayak Sen. However, the judge accepted the police claim that the statement in the Supreme Court (SC) was a “typographical error”. Here are two statements which are different from each other. Both of them were made on oath. A word, a figure or a few letters can be treated as typographical error. It goes against common sense and rationality to say that an important statement made in the SC on oath is typographical error. The second additional sessions’ judge, Raipur, B P Verma, has done a disservice by this statement to the Indian judicial system, which is already sinking under the burden of corruption and other misdemeanours. The prosecution states that the police recovered three letters written by Narayan Sanyal and addressed to his party comrades from the bag of Piyush Guha. The only evidence produced by the prosecution in this respect is the deposition by one Anil Kumar Singh, the “passer-by” mentioned above. He said that the police called him by gesture and introduced to him a person called Piyush Guha. The police told him that Guha was a suspected person. Then they opened his bag and recovered some CPI(Maoist) literature and three letters, which later on the police claimed were written by Narayan Sanyal. Anil Kumar Singh further said that he overheard Guha say to the police that those three letters were given to him by Binayak Sen. The narration of the event shows that he did not know when the police took Guha into custody. When he saw Guha, he was already in police custody. He did not know whether the police had picked up Guha on 1 May and planted the letters and other articles on him. Yet the whole case rests on this Anil Kumar Singh assertion that he heard Guha say to the police that Binayak Sen had given him the letters. This hearsay has no evidentiary value. The statement made in police custody is not admissible against the accused. Once the police fail to prove that they caught Guha from station road, the whole edifice of the case falls. Besides, Binayak Sen visited Narayan Sanyal with the permission of the senior superintendent of police. The prisoners are permitted to write letters. The restriction is that the prison authorities will read the letters and censor them, if necessary, before they are sent out. So the presumption is that the letters did not contain anything objectionable unless one concludes that the jail authorities collaborated with Sanyal to carry on illegal activities, in which case the judge should have asked the government to take legal action against the jail authorities. The judgment does not say whether the content of the letters was objectionable or not. No action could have been taken against the accused unless the content was unlawful. A discussion about the central point is missing in the judgment. Carrying letters from prisoners is not unlawful in itself. Some of the things which the judge says are strange, and they do not go well with a supposed judicial mind. The judge refers to several people as Naxalites and treats them as criminals. There is no law in India or anywhere else in the world which defines the term “Naxalite” and treats them as criminals. However, the burden of the judgment is the term “Naxalite” and the inherent criminality of the term “Naxalite”. The judgment keeps on saying that Binayak Sen and Piyush Guha knew Naxalites and met them. The judgment uses interchangeably the terms “Naxalite” and CPI(Maoist) and concludes that Sen and Guha aided and abetted the CPI(Maoist), which is a banned organisation. The judgment repeats that some letter or letters recovered from Sen’s house address him as “comrade”. The learned judge takes it for granted that “comrade” meant that Binayak Sen was a member or supporter of the CPI(Maoist). The English dictionaries state that “comrade” means an intimate friend or associate or companion. Does the judge know that Pandit Jawaharlal Nehru, Subhash Chandra Bose and Jayaprakash Narayan were addressed as “comrades”? Clement Attlee, the former prime minister of England, was addressed as “comrade”. One can rest assured that he does not know. Can India afford to have such judges to decide the fate of human life? The judgment is arbitrary to the extreme. It does not define the terms; it does not set up a nexus. Just one instance will demonstrate the whimsicality and ideological bias of the judge: “Amita Shrivastav was a teacher in Daga Higher Secondary School two years ago. She came to the school through Ilina Sen who is acknowledged by Binayak Sen as his wife. She worked in the school for seven months and then stopped coming to the school. Amita had a CD related to the Second World War Nazi camps. This was shown to the students in the school. Later it was found that Amita was connected to Naxalites and had absconded”. It is really shocking that the judge interprets anti-Nazism as Communism. How did the judge know that she was connected to Naxalites and she had absconded? How did he know that she had not been abducted and killed by some criminals like Salwa Judum? The judgment is full of such absurdities. Two examples will further illustrate the point. One case is the way he deals with a telephone conversation between Bula Sanyal and Binayak Sen. Bula Sanyal is the sister-in-law of Narayan Sanyal. The judge concluded from this that there was contact between Binayak Sen, the family of Narayan Sanyal and CPI(Maoist) supporters. Narayan Sanyal being a Naxalite the judge inferred that his whole family consisted of supporters of CPI(Maoist). Sen’s conversation with one of the family was sufficient proof that he was also a CPI(Maoist) activist. The contentions of this sort are really asinine. The judge accepts the police version of Salwa Judum and says that it is not a state organised vigilante squad and is a spontaneous reaction of the tribals against Naxalites. The judgment indicates that “terrorism and oppression of the Naxalites increased so much that it became a question of life and death for the tribals of the area. Such reasons led to the launching of anti-Naxalite Salwa Judum campaign”. The judgment tries to explain what the ‘Salwa Judum’ means. “‘Salwa’ means peace and ‘Judum’ means meeting at one place for some specific purpose”. The judge makes reference to some articles seized from Piyush Guha and states that “they have demonstrated opposition to Salwa Judum and praised People’s Liberation Army and paid homage to the killed Maoist comrades”. On the basis of such facts and logic, the judgment pronounces that Piyush Guha, Binayak Sen and Narayan Sanyal have committed sedition. The accused have been punished under Section 124-A of the Indian Penal Code, which deals with sedition. It says that “whoever by words, either spoken or written . . . brings or attempts to bring into hatred, contempt, or excites or attempts to excite disaffection towards, the government established by law in India, shall be punished with imprisonment for life. . . .” A literal adherence to the Section makes every opposition to the government an offence punishable with life imprisonment. The Comptroller and Auditor General’s report states that the Indian state has lost 1.76 lakh crore because of the fraudulent dealings in the allotment of 2-G spectrum. A writ petition pending in the Supreme Court alleges that Rs 70 lakh crore has been deposited abroad to evade tax. These are enormous sums which could have made a difference to the quality of life which the Indian masses lead. Free education and free medical treatment are constitutional mandates. However, they have not been implemented on the plea that there was no money. If one articulates such matters, it naturally brings the government established by law into contempt and hatred and causes disaffection towards the government. It means that the vast majority of people can be prosecuted and jailed under this section. But where do we keep them? The whole country will have to be converted into the prison camp. Is this not an irredeemably absurd idea? The constitutional validity of the Section 124-A the IPC has been challenged in the Supreme Court and the Court has repeatedly said that the sedition as defined under Section 124-A can be constitutionally tolerated only if the prosecution proves that the statement of the accused has led to violence. The judgment in this case does not even discuss the content of the letters allegedly recovered from Piyush Guha and whether he delivered them to the CPI(Maoist). If he delivered them to the party, the prosecution had to further prove that the letters led to such and such specific incidents of violence. The judgment is absolutely silent on such points. The judgment manifests the misuse and abuse of Section 124-A of the Indian Penal Code. A law which is so susceptible to misuse and abuse in raw hands or biased minds should be deleted from the statute book of India, which claims to be the largest democracy in the world. This judgment is one more symptom of the ideological degeneration of the Indian judicial system. The judgment in the Babri Masjid case resorted to rule of faith in place of rule of law. In this case, the judge says that Piyush Guha has to prove that he was arrested from Mahindra Hotel on 1 May, not on 6 May and the letters were planted on him new through the prima facie evidence was in favour of Guha. The judge shifted the burden of proof to the accused, which violated the basics of the criminal justice system. The judgment indicates that the Indian judiciary is moving backward.